GET READY for yet another wave of new breweries in and around Philadelphia. By my count, up to 20 more should be opening between now and next spring. Some are tucked in city neighborhoods or borough shopping districts; other larger operations are setting up shop in suburban industrial parks. Notably, a third of the newcomers are opening on the other side of the Delaware, thanks to recently enacted New Jersey liquor regs that allow small breweries to sell draft beer to visitors. I'll be writing about them next week. In the meantime, here's what's on the horizon in Philadelphia and its four suburban counties. Status: Brewing has begun; restaurant to open later this fall. Brewer: Scott Morrison, formerly of Dock Street and McKenzie's Brewhouse. About: The former General Lafayette Inn & Restaurant is now in the hands of Erin and Scott Wallace, who operate the popular beer-oriented bars Devil's Den (South Philly) and Old Eagle Tavern (Manayunk). Look for Barren Hill brews to pour at both locations and at the renovated brewpub, just across the Montgomery County line, on Germantown Pike. Beer: Morrison, known for his farmhouse ales, appears to be spreading his wings with new hybrid styles, including Double Berliner Weise, German Imperial Pilsner and a French version of Oktoberfest, called Biere de Octobre. Location: 3245 Amber St., Kensington. Brewhouse: 10 gallons, to be expanded to seven barrels, with tasting room. Brewers: Tom Sheridan, Benjamin Bedard. About: Sheridan grew up at Emerald and Ontario streets. He owns a Web-development firm and partnered with Bedard, who works as an electrical engineer in Ardmore. They're brewing at The Loom, a massive former textile mill converted into workspace for artisans. Beer: Just one so far, Benjamin Franklin's United Ale, a cream ale flavored with blood orange and coriander. It made its debut last week at Fishtown's Barcade. Status: Opened six weeks ago. About: The latest in a recent spate of ultratiny breweries just opened its doors in a warehouse off Route 23, on Hollingsworth Drive. "I'm looking for investors to grow into something larger," Armstrong said, "I'm hoping to go to a 10-barrel system in a couple years or so." Beer: A variety of English-style pales and Belgian ales on tap at its tasting room, 4-8 p.m. Tuesday to Friday, and noon-8 p.m. on Saturday. Limited varieties on draft at local bars, including the Craft Ale House (Limerick), Railroad Street Bar & Grill (Linfield) and the Pour House (Pottstown). Status: Construction underway, opening expected this winter. About: Patton, a longtime homebrewer, lost his attempt to build a small brewery in Fishtown, so he's moved northward to build a full-scale brewery and pub in a former carriage house used by the 19th-century Theo Finkenauer Brewery. Patton raised some seed money through Lucky Ant crowd-source fundraising. Beer: Patton has been tinkering with a variety of styles, including a classic cream ale. Brewhouse: Three barrels, with tasting room. Brewers: Joe Fazekas, Bub Grosse. About: Although Fazekas and Grosse, along with partners Mike LaCouture and Jason Grosse, have no brewery experience, they've been working for two years to put together their business plan. Operating out of an industrial park, they'll start with draft beer only, with hopes to produce canned beer within a year. Beer: "We're definitely going to take some chances . . . some off-kilter beer to go along with some standard styles," said LaCouture. Status: Awaiting licensing, construction underway, expected opening January. Brewers: Chris Braunstein, Mark Osborne. 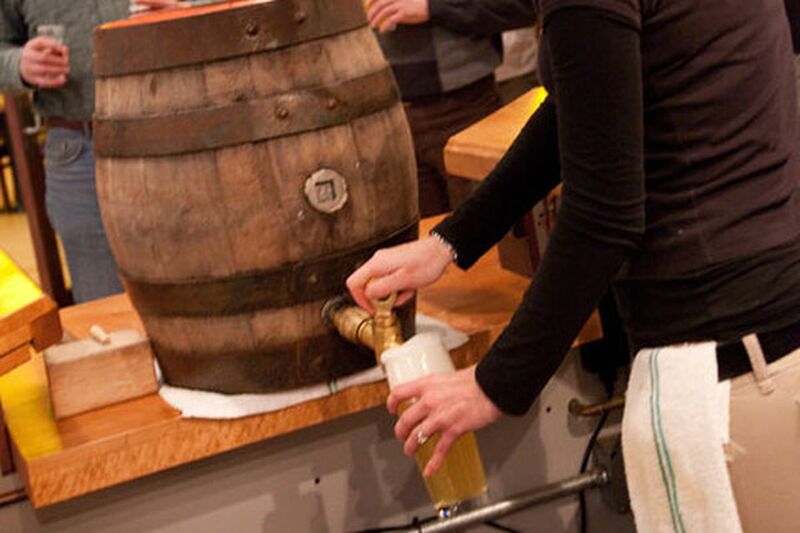 About: The 50-seat Broad Street brewpub is owned by the brewers' wives, Jen Braunstein and Jocelyn Osborne, who are new to the restaurant business. Their husbands have brewed together as hobbyists for years. Beer: "They're kind of like Jekyll and Hyde," Jen Braunstein said of the two brewers. "Mark is super scientific and loves traditional brewing styles. Chris tends to do newer styles - sours and hoppy. When they collaborate, they do amazing stuff." Status: Build-out of former antiques store underway; opening slated for late February. Brewer: Owen Hutchins, formerly of General Lafayette Brewery. About: Hutchins, who had left the beer business entirely, is returning with his wife, Jennifer McGuire, a program coordinator at the Abramson Cancer Center, at Penn. "He's wanted to get back into business for a long time," McGuire said. "We finally decided the only reason we weren't doing it is because we were afraid to try." Beer: Look for the return of a Gen. Lafayette mainstay, Germantown Blonde kolsch, with a bitter, an IPA and a stout. "Some classic beers, and then who knows what happens," McGuire said. Status: Under construction, licensing approved, opening spring 2014. Brewhouse: Seven-barrel production facility with on-site growler fills. About: Currently working in IT for a school district, Knechel is a homebrewer who buffed up his résumé with internships at Harvest Moon, in New Brunswick, N.J. In a first for Pennsylvania, the brewery will open directly next door to a distillery, Hewn Spirits. Beer: "We'll brew everything from light summer ale to dark, smoked butternut squash porter," Knechel said. Expect some barrel-aged brews, too, with used casks from the next-door neighbor. Brewhouse: Five barrels, with 250-seat restaurant. About: Downingtown's Victory Brewing is in the midst of a massive expansion, with a second production brewery in Parkesburg, Chester County. Its new brewpub in downtown Kennett Square will fill the bottom floor of a luxury apartment building. Beer: Victory's core brands plus new brewpub exclusives. Status: Expected opening in early 2014. Brewhouse: 15 barrels, with tasting room. Brewer: Andrew Horne, formerly of Yards Brewing. About: Located just off the Valley Forge Bicycle Trail, the brewery will add a new dimension to Conshohocken's continued resurgence. Co-founder John Remington, working with several partners, said he expects to renovate an existing Elm Street warehouse as environmentally friendly green space. Beer: No details yet, though beer will be distributed locally in kegs and, possibly, cans and large bottles. _ Iron Hill Brewery & Restaurant, Ardmore. The successful area chain's 11th location, coming in 2014. _ Stable 12, Skippack. No solid details on this one, but it did raise more than $20,000 seed money in a Kickstarter campaign earlier this year. "Joe Sixpack" is by Don Russell, director of Philly Beer Week. For more on the beer scene, sign up for his weekly email update at joesixpack.net. Email: joesixpack@phillynews.com. Want to be Reading Terminal Market’s newest merchant? A contest will decide who gets to move in. Swingers’ night in the suburbs? I went to the Yardley Inn to find out.